Cairns is one of the most popular tourist destinations in Australia. 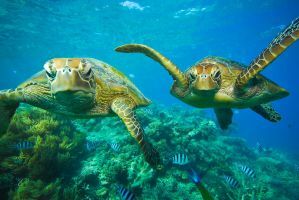 It's the gateway to the Great Barrier Reef, and it's particularly popular with young backpackers who are looking to hang out on the beach and party late into the night. There is no shortage of budget accommodation that caters to this crowd. You'll also find inexpensive restaurants, cafes, and clubs. 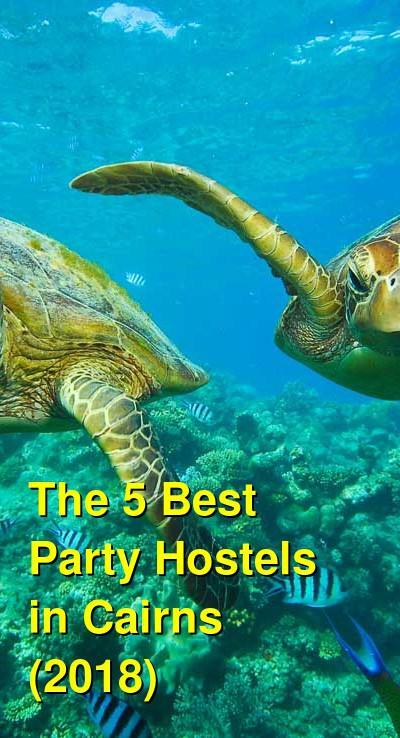 If you're looking for a good party, any of these hostels will do. How much do hostels in Cairns cost? Gilligan's is a top rated party hostel with a reputation that is well earned. It offers visitors nightly parties that attract people from afar. There's an outdoor lagoon pool and beer deck that offers beach volleyball, a zip wire, and music during the day. In the evening it transforms into THE party to be at. There are different themes and entertainment including open mics, international DJs, and more. As a guest at this legendary hotel you'll also receive all kinds of benefits. These include a free meal with the purchase of a beverage, free airport pickup, free parking, free Sunday barbecues, special discounts, and half priced entry to international DJ events. Onsite facilities include the lagoon pool and waterfall, a sandy beach with a volleyball net, pool tables, television area, and travel information. At the Calypso you can enjoy swaying palms, smooth tunes, free Wi-Fi throughout the hostel, and swinging hammocks. Chill poolside with new friends in the Queensland sunshine by day, then check out free nightly entertainment at The Zanzibar, the onsite hostel pub by night. Enjoy a free pool-side breakfast or whip up your own masterpiece in the great communal kitchen. The Calypso crew are happy to help with travel tips and local favorites. They offer free shuttle pick up from the greyhound station and premiere bus stops. Rest up in a range of rooms from dorms to private doubles and twins. All rooms have free air conditioning too so you can stay cool when it`s hot. Rooms are serviced daily and fresh linen is free for your stay. Free city maps, Wi-Fi, linen, and breakfast are included and towels are available for hire. Asylum Cairns is another legendary party hostel. They're most famous for their Mad Monday Party where you never know what to expect. With $15 you'll get a t-shirt, free entry to three different venues, dinner, pizza, and free internet. This hostel is also recognized as one of the friendliest in Australia. The customer is excellent and you'll not be disappointed if you come looking for a good time. The atmosphere is awesome, and there's an all you can eat Friday night barbecue so you can meet your fellow guests. There are plenty of benefits for guests including free pickups, free internet use, a shared kitchen, a large movie screen, swimming pool, and a nice garden. The staff can also help you make arrangement for your future travel and tours. If you're looking to join the party, then this hostel is a top pick. The Jack Backpackers is a newly refurbished pub-style backpacker accommodation. The Jack offers all guests free Wi-Fi, free evening meals, new air conditioning and fridges in every room, a tour booking shop, and huge discounts at the bar for in-house guests. The hostel has a range of rooms to choose from. All rooms come with a refrigerator, new split system air conditioning, and security lockers. The hostel is located above a pub with a huge outdoor beer garden, perfect for enjoying some drinks in the beautiful, sunny Cairns weather. The pub also has a restaurant, Casino gaming room, and crazy themed nights to make your stay that much more memorable. Located only 2 minutes from all the major shopping centers, city attractions, nightclubs, and the Lagoon. The facility offers great deals at their travel desk. You can book your tours and Cairns activities with the receptionist and travel agents to get the best local knowledge. The Jack Backpackers only accepts persons over the age of 18. Free city maps, Wi-Fi, and linen are included and towels are available for hire. Mad Monkey Village offers newly renovated affordable flashpacker accommodation. The Mad Monkey flashpacker style is reflected in the designer kitchens and bathrooms, modern decor, and brand new air-conditioners in every room. Guests can enjoy free ultra fast Wifi, free hot breakfast, free large security lockers (BYO padlock), free bicycle hire, free Gym Access, and brand new top quality mattresses, pillows & linen all new. The Mad Monkey Family create the perfect atmosphere with an outdoor pool oasis, outdoor bar with super cheap drinks, and a great social area where you can meet all new friends. Their entertainments team organize events in the hostel every day and night, before showing guests to the top backpacker bars offering cheap eats and drinks in this iconic area. Free city maps, Wi-Fi, linen, parking, and breakfast are included and towels are available for hire.